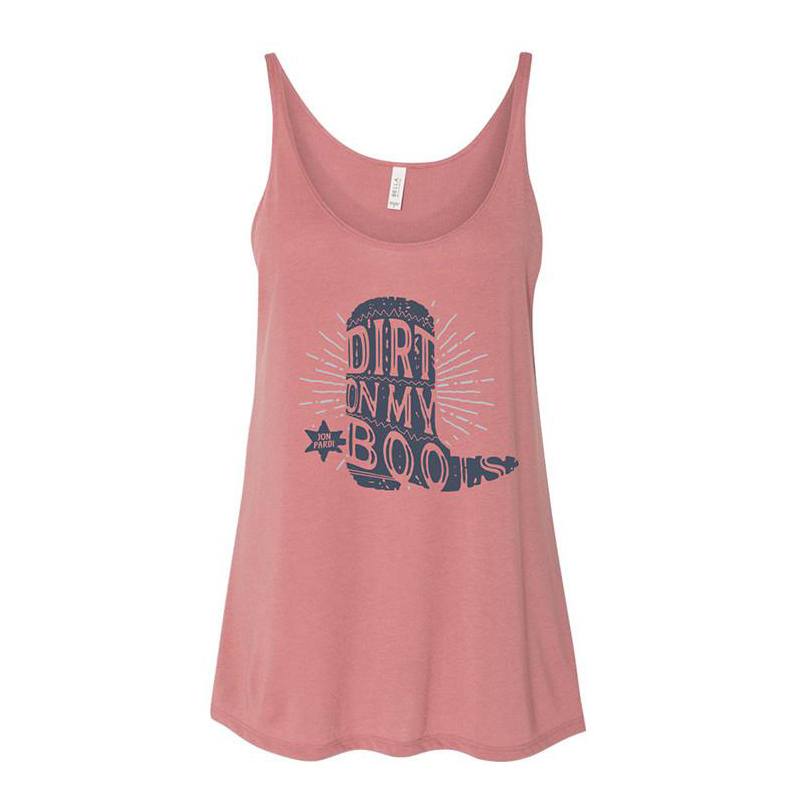 Mauve flowy poly/viscose blend women's tank with “Dirt on my boots” design. I didn’t get a tank top - I actually received a sleeveless shirt. But no complaints here!! I actually really like it and wish I could get the other tanks in this style! LOVE THIS SHIRT!!! Medium fit perfectly (I'm usually a medium, sometimes small) It was sold out at the concert so glad I could find it online :-) Happy Jon Pardi fan!! I bought the heart ache on the dance floor blue shirt in a large. It was large and huge but I like the shirt. So I ordered the pink one dirt on the boots... I got it in a size large and it was skin tight..
LOVE this tank. It’s super cute and so soft! TTS. I’ve been wanting it for awhile, and I’m so glad I finally ordered! I will be ordering the Pardi Animal tank next! These make great workout shirts! Super cute and soft tank. I only wish I had gotten one size up, it fits too snugly. The color is even prettier in person! Reviews of similar tanks say it runs large but I would disagree. The material is very smooth and stretchy, which makes it very clingy. I actually wish I would have sized up one instead of down! If you want it flowy, size up!! If you like tight, then go with your normal size. Great tank! Love the fit and quality of material. Highly recommend. Awesome tank! Soft, pretty, and print design is simple and clever! Can't wait to buy more Pardi gear! Love Love Love these shirts- I cannot wait to get another one:) Nice fit- fun color and greaat print!